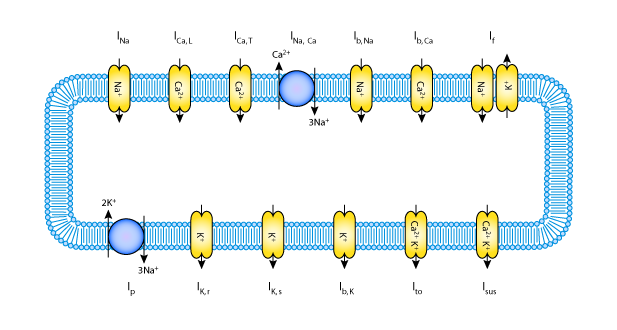 This version of the CellML model was created by Alan Garny of Oxford University, it has been unit checked and the model runs in both COR and OpenCell to reproduce the published results. The units have been checked and they are consistent. ABSTRACT: INTRODUCTION: Cardiac multicellular modeling has traditionally focused on ventricular electromechanics. More recently, models of the atria have started to emerge, and there is much interest in addressing sinoatrial node structure and function. METHODS AND RESULTS: We implemented a variety of one-dimensional sinoatrial models consisting of descriptions of central, transitional, and peripheral sinoatrial node cells, as well as rabbit or human atrial cells. These one-dimensional models were implemented using CMISS on an SGI Origin 2000 supercomputer. Intercellular coupling parameters recorded in experimental studies on sinoatrial node and atrial cell-pairs under-represent the electrotonic interactions that any cardiomyocyte would have in a multidimensional setting. Unsurprisingly, cell-to-cell coupling had to be scaled-up (by a factor of 5) in order to obtain a stable leading pacemaker site in the sinoatrial node center. Further critical parameters include the gradual increase in intercellular coupling from sinoatrial node center to periphery, and the presence of electrotonic interaction with atrial cells. Interestingly, the electrotonic effect of the atrium on sinoatrial node periphery is best described as opposing depolarization, rather than necessarily hyperpolarizing, as often assumed. CONCLUSION: Multicellular one-dimensional models of sinoatrial node and atrium can provide useful insight into the origin and spread of normal cardiac excitation. They require larger than "physiologic" intercellular conductivities in order to make up for a lack of "anatomical" spatial scaling. Multicellular models for more in-depth quantitative studies will require more realistic anatomico-physiologic properties. Note: There is a second variable which varies between models; version. If version=0 the CellML model behaves like the Zhang et al. 2000 model. If version=1 the CellML model describes a 0D capable, or suitable for single cell modelling, and if version=2 the CellML model describes a 1D capable, or suitable for multicellular modelling. By default the CellML model is setup to describe a central SAN cell (dCell=0) suitable for single cell modelling (version=1). A schematic diagram describing the current flows across the cell membrane that are captured in the Garny et al 2003 'published' and "0D capable' models of the action potentials in the cells of the SA node. The 1D capable model has one additional current called I_Cap - or a persistant calcium current. Derived from workspace Garny, Kohl, Hunter, Boyett, Noble, 2003 at changeset 60a465479945.